The former Grimaldis, restaurant and bar located at 123 Bay Avenue, Highlands, New Jersey, has been sold according to Barry Bielat of Bielat Santore & Company, Allenhurst, New Jersey, the broker for the sale. Prior to Hurricane Sandy, the location was the home of Grimaldis Coal Brick Oven Pizzeria; in fact, the coal-fired brick oven is one of the only items that survived Sandy. Patsy Grimaldi, the founder of Grimaldi’s Pizzeria, learned to make pizza at age ten at Patsy’s Pizzeria, his uncle Patsy Lancieri’s restaurant in Italian Harlem in 1941. Decades later, Grimaldi decided to go into business for himself and originally planned to his own restaurant in Manhattan. However, Grimaldi believed coal-fired brick ovens produced the best pizza and new coal ovens were illegal in Manhattan. As a result, Grimaldi opened Grimaldi’s Pizzeria in Brooklyn, New York in 1990. 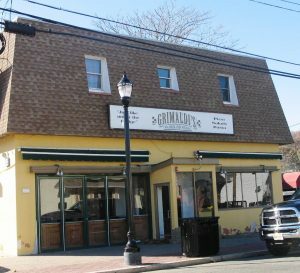 In the late 1990s, Patsy Grimaldi retired, selling the Grimaldis name and franchise. Highlands, New Jersey was one of those franchise locations.